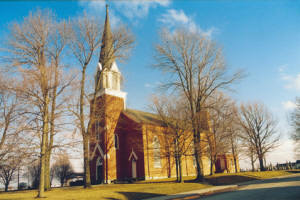 St. Peter Church is northeast of Ft. Recovery, located 1-1/2 mile north of 119 at the corner of Philothea Road and St. Peter Road. 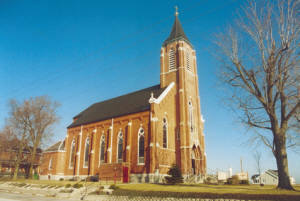 St. Peter Parish was established in 1858 when permission was granted by the Archbishop of Cincinnati to build a church. The first edifice was a brick structure, with the work being done by the parishioners, even the making of the bricks. When it came time to choose a patron for the new congregation several saints were suggested. The willingness of one Peter Kerber to do the extraordinary was the deciding factor in the choice of St. Peter. The first mass was celebrated January 1, 1860. The Society of the precious Blood provided the parish with priests at the time. At first priests came from Mary’s Home in Trinity, Indiana for Sunday mass. For a time St. Peter shared a pastor with Mary Help of Christians Parish. After 1886 the parish had a pastor of its own. 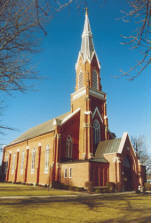 The present church was built from 1904-1905 and the rectory was built in 1912. In 1964 a basement was dug and finished, complete with a kitchen. 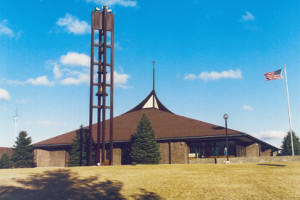 In 1968 the steeple was removed and rebuilt forty feet lower than the original. In 1972 a garage was added to the rectory. In 1984 St. Joseph lost its resident pastor, and St. Peter and St. Joseph began to share a pastor. What once was separated in 1860 was reunited in 1984. This was only the beginning of the changes that would occur over the upcoming years. July of 1999 St. Peter and St. Joseph joined with St. Anthony parish to become one cluster under the direction of one priest. Then again in July of 2004 another change in clustering occurred. This time the Catholic Community of Fort Recovery became known as the Fort Recovery Cluster. This cluster includes: St. Peter, St. Joseph, St. Paul and Mary Help of Christian Parishes under the direction of one Pastor and an Associate Pastor.